Wright State Police Sgt. Chad Oleyar, right, with Chief of Police David Finnie at the Knights of Columbus Blue Coat Awards ceremony. Wright State Police Sgt. 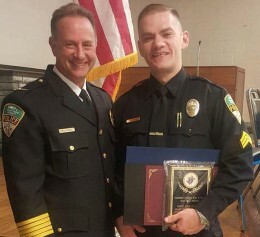 Chad Oleyar was named Officer of the Year 2016 at the Knights of Columbus Blue Coat Awards. The Knights of Columbus Blue Coat Awards honors police officers and firefighters for their service to the community. Oleyar has worked in the Wright State Police Department since 2007 and was promoted to sergeant in 2011.